New work by David Hamilton: 'Homecoming - Te Hokinga Mai'. This is a setting of the poem by Vincent O'Sullivan, originally written for the consecration of the Tomb of the Unknown Warrior in Wellington in 2004. The work is scored for alto solo (Kate Webber), mixed-voice choir and chamber orchestra. 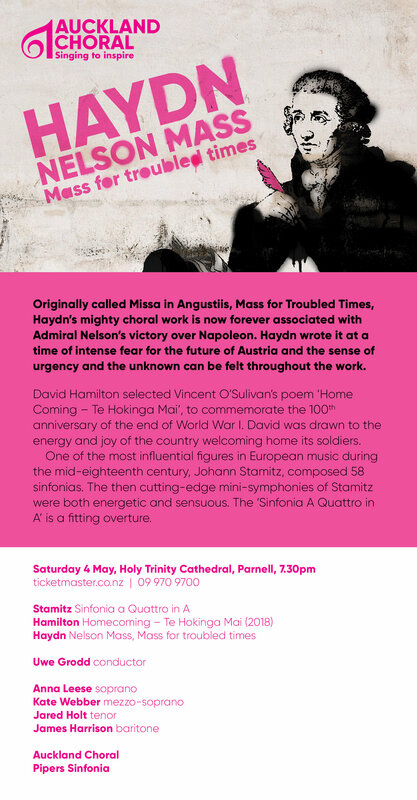 The concert also features Haydn's "Nelson" Mass and music by Stamitz.